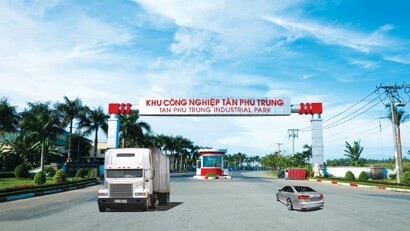 With an open investment environment, enabling investment policies and best conditions for investors provided by the Ho Chi Minh City People’s Committee, plus very appealing supports and incentives offered by the investor - Northwest Saigon City Development Joint Stock Company (SCD), Tan Phu Trung Industrial Park has gradually become an ideal destination for domestic and foreign investors, thus contributing to the development of Ho Chi Minh City’s socio-economic development, industrialisation and modernisation. Tan Phu Trung IP is located in the 6,000-ha Northwest Saigon City Urban Area, planned to be a commercial gateway of Ho Chi Minh City and the Southern Key Economic Zone to the world. Advantages of Tan Phu Trung IP consist of a harmonious and sustainable industrial urban plan, a very convenient location for strengthening connectivity with other provinces, cities and economic centres in the Southeast and the Southwest as it is just 25 km from downtown Ho Chi Minh City, 15 km from Tan Son Nhat Airport, 27 km from Saigon Port, 20 km from Saigon Railway Station, and 55 km from Moc Bai Border Gate. It is bordered by Tay Ninh province to the north, Binh Duong province to the east, Long An province to the west and Hoc Mon district to the south. Traffic access to the industrial zone is also very convenient thanks to National Highway 22 - one of Trans-Asia roads connecting Ho Chi Minh City to Cambodia; National Highway 1A - the most important traffic route in Vietnam passing through half of the provinces and cities in the country and connecting four major cities of Hanoi, Da Nang, Ho Chi Minh City and Can Tho; Provincial Road 8 linking to the Key Economic Triangle of Long An, Binh Duong and Ho Chi Minh City. With these important traffic routes, Tan Phu Trung IP enables investors to take advantage of the position as the gateway to the Southern Key Economic Zone, the Mekong Delta and the Kingdom of Cambodia, while helping them easily recruit employees, source input materials and seek consumption markets to reduce production and business costs. In addition to its prime location, Tan Phu Trung IP is also well-developed and modern, with 359 ha of rentable industrial land ready for tenants to build factories and 48 ha of land for building houses for professionals and workers, facilities for medical services and banking services. The vast ready land fund plus good geological conditions is also a big plus of the industrial zone, helping investors with various choices of area fit to their business purposes, while reducing construction investment costs. In addition, the appeal of Tan Phu Trung IP comes from abundant and diverse products like industrial land for factories, warehouses and standard workshops, meeting investors’ demands for quick production; and from abundant and skilled workers in Cu Chi and neighbouring areas ready to meet tenants’ recruitment demands. Particularly, inheriting the potential, finance and experience of Kinh Bac City Development Holding Corporation (KBC), a subsidiary of Saigon Invest Group (SGI) - a leading developer of industrial parks in Vietnam, Tan Phu Trung IP is fully capable to develop into a modern world-class industrial park to give tenants added value. Tan Phu Trung IP advocates calling for investors engaged in mechanical engineering, electronics, information technology, pharmaceuticals and cosmetics, food processing, beverage production, biotechnology and other industries using advanced environment-friendly technologies. The abundant and well-trained labour force in Cu Chi and neighbouring areas is always ready to meet the demand of tenants. Not only getting support from Northwest Saigon City Development Joint Stock Company to carry out investment procedures and accessing many other services in the course of deploying their projects in Tan Phu Trung IP, tenants are also offered preferential corporate income tax policies; that is, a two-year exemption from corporate income tax and a next four-year half reduction of the tax. In addition, investors may apply free of charge for investment certificates, business registration certificates and other legal procedures. Investment methods in Tan Phu Trung IP are also implemented in a flexible manner, adapted to the requirements of each investor who can rent land to build factories on their own or can rent prebuilt factories and offices to do business. Thanks to diverse products, flexible investment modes, reasonable preferential policies, considerate customer services and enthusiastic employees, Northwest Saigon City Development Joint Stock Company has gradually built up its good relationship with investors. The company always attentively listens to feedback and opinions from investors and speeds up infrastructure completion to improve the business climate. For new investors, the company always accompanies and actively supports them to fulfil procedures for business establishment and construction permits. This is also the reason why some operational companies are very satisfied with products and services of Tan Phu Trung IP and voluntarily act as a very effective marketing channel for it. Since early 2016, Tan Phu Trung IP has attracted 29 investors engaged in various industries such as mechanical engineering, packaging and pharmaceuticals. Remarkable tenants include Isuzu Vietnam Co., Ltd, Vina Industrial Gas Trading & Service Co., Ltd, Bachy Soletanche Vietnam Company, United Packaging Co., Ltd, and Mekong Production Trading Joint Stock Company. In the fourth quarter of 2018, SCD will continue to sign contracts with some new investors. The trust of investors has also partly proved that Tan Phu Trung IP gathers all potential advantages and tempts investors because of its strategic location, easy traffic access, good geographic features, comprehensive planning, attractive investment incentives, and abundant labour resources among others. Indeed, Tan Phu Trung IP is a perfect destination for investors to develop business operations and enhance financial health and strength.